Beef up your beef eating skills this winter and head to Nawab Eating House for a full dose of meaty deliciousness. Tucked away on Collin Street, this is a hidden gem for beef eaters. 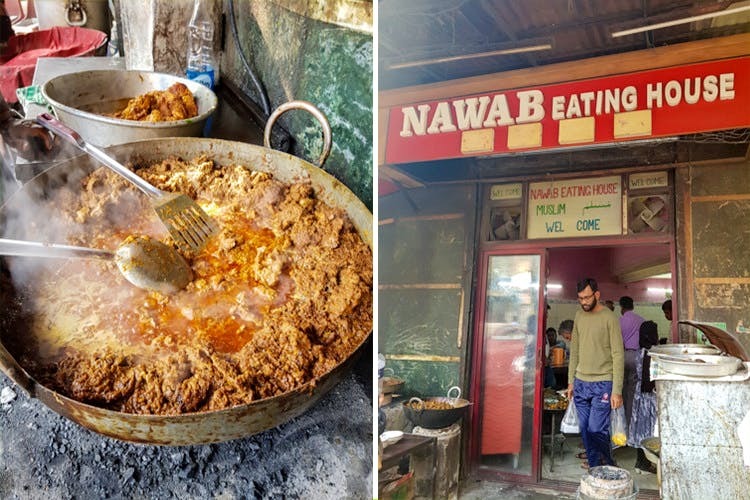 You can get a hearty meal here for as little as INR 100 More than 100 years old, Nawab Eating House is an unpretentious eatery with old wooden tables, white tiled and pink walls and customers trying to find a place for themselves. It’s open from 6am in the morning till midnight, and table sharing is a must here, as it can accommodate only around 15 people at one go. Don’t expect any menu cards, waiters in maroon shirts and wearing lungis will be reeling off the items on offer. As you enter you’ll see piping hot beef bhuna, beef keema, beef chaap being cooked on old metal kadais. And they have a winter special beef nihari too and of course, beef biryani. Priced around INR 40 to INR 50 per dish, this is more than a pocket-friendly deal. This is a blink-and-a-miss place so be careful while searching for the place in the over-congested Collin Street. Lunch hours are crazily packed with people having Bengali meals too.